2 x 19" Round Mailing Tube with end caps. Made from 1/8" spiral-wound double-wall cardboard. 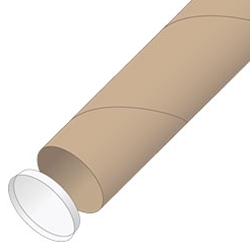 Round Mailing Tube with end caps. Inside dimensions: 2" x 19"
2 x 25" Round Mailing Tube with end caps. Inside dimensions: 2 x 25"
2 x 31" Round Mailing Tube with end caps. Inside dimensions: 2 x 31"
4 x 25" Round Mailing Tube with end caps. Inside dimensions: 4 x 25"
2 x 18" Triangular Mailing Tube with built-in end caps. Made from 200-pound-test corrugated cardboard. Inside dimensions: 2 x 18-1/4"
Made from 200-pound-test white-one-side corrugated cardboard. 2 x 24" Triangular Mailing Tube with built-in end caps. Inside dimensions: 2 x 24-1/4"
2 x 30" Triangular Mailing Tube with built-in end caps. Inside dimensions: 2 x 30-1/4"